I have been thinking for quite some time about how and when to start teaching my daughter about the wise use of money. She maintains a piggy bank and puts all the money which she gets in that. I wanted to teach her some more about the value of money. This year on her birthday I asked her if I give her 500₹, will she be able to organise her birthday party in that. I would help her in planning and working on the details. She was very excited with the thought. She told me that she would like to work with the details and then decide whether she could do it or not. She made a list of 10 friends. She asked me to take her to the market and take a look at the snacks that we could serve. We went there but she was not very happy with the readymade snacks as she had got bored of them. She wanted some different and tasty snacks. On our way back home, she started telling me about dishes and snacks which her friends brought in their lunch and how they enjoy sharing them during their lunch time in school. She wanted those dishes in her party. I suggested that perhaps she can ask them to bring those dishes instead of presents and they can share them at our party. She called up her friends and made her request. All of them agreed with her. Thus, it was decided that her friends would bring a homemade dish to be shared amongst themselves instead of any birthday presents. Next we came to decorations. She had seen in her school that whenever there are some celebrations, her teacher decorates the class with the art and craft objects made by the students. She came up with a number of ideas on decorations learnt from her school. We made a few cutouts, drawings and other craft objects. She also decided to hang her toys, balloons and some origami creations which she always keeps with her. She could thus save on decorations too. She asked me if I could bake a chocolate cake at home. She would decorate it with chocolate syrup, choco-chips and gems. We make it often at home. She had learnt a number of drinks during her summer camp which she could prepare herself. When everything was planned, she told me that she doesn’t need that money and she would put it in her piggy bank. She asked her grandmother to give her a rose bouquet as a present. She took out the roses and put them on “thank you” cards which she made herself for everyone as a return gift. She learnt a few magic tricks which her grandfather had been showing her. She said that she would impress her friends with her magic tricks. They would be entertained also with them. She surprised me by saying that she could save all the money and celebrate her birthday too. It will be a different party and she would enjoy it too. When she told me the whole programme, I was overwhelmed and had tears rolling down my eyes. 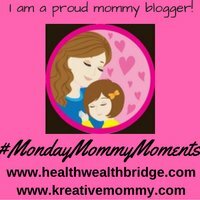 This post is in a link up with #MondayMommyMoments. Read Deepa and Amrita‘s post as link ups. This is a beautiful post Vidhi.Thank you for sharing this on #MondayMommyMoments.I am sure you are a wonderful mommy to be able to teach a little one about the best way to have fun and keep living well.Absolutely loved this post.How old is your daughter by the way? Thanks a lot, Dr Amrita. I do try my best to instill good values in my daughters. My elder one is 9 years old. Loved the post and the ideas rolled behind. Thanks for liking my post. Do read my other posts also. She does surprise me with her wisdom. Blessed to have her in my life. Awesome. Good bless her. You must be a proud moment of a content daughter. Awesome. Good bless her. You must be a proud mom of a content daughter. So cute. So thoughtfull of her . This is her love. I am feeling so happy for you Vidhi. Such a lovely post. lots of love to your daughter from me. Wow that’s really wonderful and inspiring post for many kids. She is such a brilliant and intelligent daughter. She knows the real importance of saving money even in this tiny age. God bless her and it is just because of you momma because these great thoughts no doubt taught by the parents only. How cool is that. Kids learn so much from doing & they teach us too. This is a wonderful idea that even I will try. Will get my daughters to organise the next play date n see how it goes. OH So lovely!! She sounds like an observant child. SOmeone who can empathize and share love. I wish her all the best.